The Red Haven Peach is consistently the best tasting peach in any supermarket. 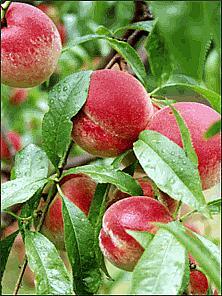 Red Haven Peach Trees grow very rapidly, and give you an abundance of fruit quickly. Best of all, it's surprisingly easy to grow. Red Haven peach trees are normally planted in pairs so they can pollinate each other. This pollination causes your trees to produce more fruit. We recommend cross-pollinating your Red Haven with the Elberta Peach Tree. Full of flavor including a pleasing aftertaste! Great for snacks, meals or desserts. With proper care, you will be able to start picking peaches after the first season, or as soon as the first year under optimal conditions. Not only are they full of flavor, but they are also HUGE! These are one of the largest peaches you can find. Red Haven Peaches ripen in June.